Following the release of the first trailer, The Weinstein Company has released seven new character posters for Quentin Tarantino‘s The Hateful Eight. 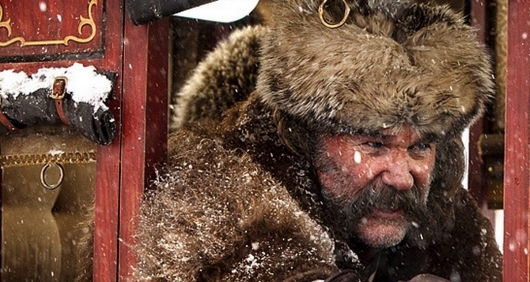 The film is Tarantino’s eighth directorial effort, takes us back to a few years after the Civil War (no not the Captain America movie), and sees a bounty hunter John “The Hangman” Ruth (Kurt Russell) and his fugitive Daisy Domergue (Jennifer Jason Leigh), forced to hunked down with six strangers when a blizzard hits Wyoming. Check out the full set of posters below. A panel for director Quentin Tarantino‘s second film in the western genre, The Hateful Eight, was held at San Diego Comic-Con. During the panel, seven minutes of footage that introduced the characters were shown to the audience. Descriptions of the characters and more information shared during the panel can be found below, along with a new poster for the movie.